Google introduced a new match type, well, a modifier to a match type that helps you control your match types a bit more. 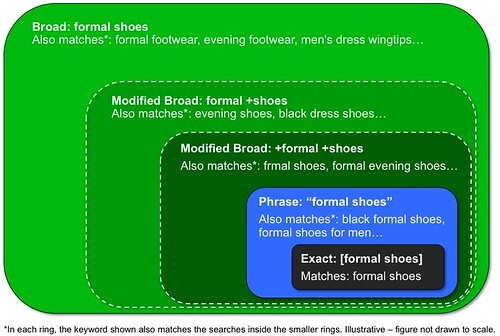 The modifier lets you be more specific with your broad match keywords, but be more lax than the phrase based match. This new modifier is named the "broad match modifier" and it is currently being tested in Canada and the U.K. To implement the modifier, just put a plus symbol (+) directly in front of one or more words in a broad match keyword. Each word preceded by a + has to appear in your potential customer's search exactly or as a close variant. Close variants include misspellings, singular/plural forms, abbreviations and acronyms, and stemmings (like “floor” and “flooring”). Synonyms (like “quick” and “fast”) and related searches (like “flowers” and “tulips”) aren't considered close variants. I'm sure I'm not the only one that has been very cautious with broad match because of the lack of control in how it's expanded to match other queries. Modified broad match makes a big difference for this issue.